You may be surprised to learn how many people in completely different job functions are affected by backflow preventer installation and placement. We all know there's a designer that creates plans with some sort of backflow prevention for commercial and industrial building water lines. Then of course you would expect the property owner and the water municipality to have some input as well. That's about it, right? Actually, as we've spoken with those designers and water utilities, we've learned that there are at least seven different voices to listen to when it comes to backflow placement. The really surprising part is that while they all work in different industries and their goals vary, each voice seems to be searching for the same solution. Let's check out what each person has to say. In determining valve type and placement, designers are often slowed down in the plans review process because the minimum required protection is commonly determined on a case-by-case basis. In response, some designers - and even entire design firms - intentionally specify the highest level of hazard protection in order to avoid a lengthy plans review cycle. This means reduced pressure zone backflow devices. They provide a higher level of protection than the previously popular double check valves. More RPZs are being installed than ever before. Learn more about the differences here. Backflow prevention manufacturers provide discharge rates for their RPZ products like these from Watts. Drainage systems for indoor RPZ backflow preventers should conform to the discharge rate tables of the chosen assembly as provided by the manufacturer. Calculating flood and drain rates of common RPZ valves leads to the conclusion that “The floor drain capacity requirement for RPZs with a 3” diameter or higher are likely to be cost prohibitive due to the necessary pipe diameter and fall rates.” This is a direct quote from David DeBord, education chair of the American Society of Plumbing Engineers. He wrote at length about the topic in the summer 2014 edition of Chicago’s ASPE publication. He recommends all RPZ valves be installed outside to avoid these problems. Water utilities demand that the backflow assembly be located as close to the meter as possible to minimize the risk of unmetered consumption through unauthorized taps and to simplify routine inspection. Meters for all water lines for industrial and commercial buildings are typically installed as close to the property line as possible for similar reasons. This means that all backflow prevention valves - both RPZ and DC - should be installed with the meters close to the property line as well. They can either be installed in a vault if they are DC, but we know that those are becoming more rare, or they can be installed aboveground possibly in an enclosure. Once again, the recommendation here is that backflow assemblies be placed outside. Property owners intrinsically want to utilize their space to its maximum value. Indoor backflow preventer assemblies reduce the rentable square footage of a building, reducing revenue and property value. How much space is really lost though? On average it’s about 33.325 square feet. If the annual rent value is $999.75 (based on Class A office at $30 per square foot) then the 25 year cash flow is $34,149.22 (based on 2.5% inflation). The net present value of that space is $12,156.48 accounting for a 9% discount rate. So the question is, will placing the system inside save $12,156.48 over any other method? The answer to that question is typically a resounding “no.” The images below shows the four options for installing an RPZ containment backflow prevention assembly (CBPA) and how much money each option saves. You'll find as we did that for property owners, the answer is to move backflow installation outside, since not having one isn't actually an option. Firefighters need access to their connections as close to the property’s tap location as possible in order to ensure maximum pressure. Typically, that means immediately downstream of the backflow preventer. It is also common for firefighters to need access to the backflow preventer itself. 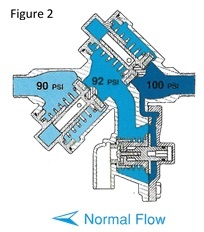 If the backflow valve is inside the building, then the connection will be in or against the building. This creates unnecessary risk by forcing the firefighters to either enter the burning building or search for the closest fire hydrant. Who wants to run into a burning building? When time is running out, however, it is not often prudent to try and find a hydrant. Both the backflow preventer and the fire department connection should be as far away from the building as possible to improve firefighter safety. The safest and smartest place is again outside near the property line. Want more specifics on Trends in Backflow Preventer Installation? Read our free eBook. Vaults often flood. Sometimes it's a function of the site characteristics such as the water table, placement, or grading. These flooded vaults are likely in violation of UPC 602.1 or IPC 608.1. These two codes are what the majority of water municipalities use to dictate backflow preventer installation and placement to protect the water supply. There are only 7 states that do not use one of these two codes, and their regulations are of course similar. Installing backflow prevention devices outside and aboveground is in line with both of these codes. OSHA’s increasingly stringent confined workspace regulations make work in vaults expensive and complicated - even routine valve testing. In fact, as of August 2015, a new permit system is in place for entry into hazardous or potentially hazardous spaces. Most water vaults are included in these new regulations. The permit requires several administrative items to be named or declared including names of entrant, assistant, supervisor, the purpose of the entry, the time required for entry, the work done, the emergency services standing by in the event of an emergency and so on. These days, there is no way to open one of these things with less than a 4-figure expenditure. 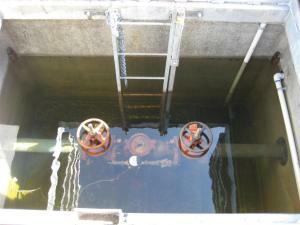 There are no OSHA permit systems in place regarding backflow enclosures. All seven point to the same solution. They all benefit from outdoor above grade backflow installation. Installing backflow prevention assemblies outside aboveground requires frost protection or freeze protection in almost all of the United States. If your municipality ever reaches 32 degrees or below, you need freeze protection. Frost protection should be sufficient for those climate zones which only experience cold weather infrequently and temperatures do not drop below 32 degrees. Additionally, equipment installed outside requires some security measures even when weather is not a consideration. Protection from theft, vandalism, and even accidents is necessary. The only option that satisfies everyone's needs, from safety considerations to how to make the most money from a property, is to install an RPZ valve outside and to use a backflow enclosure.